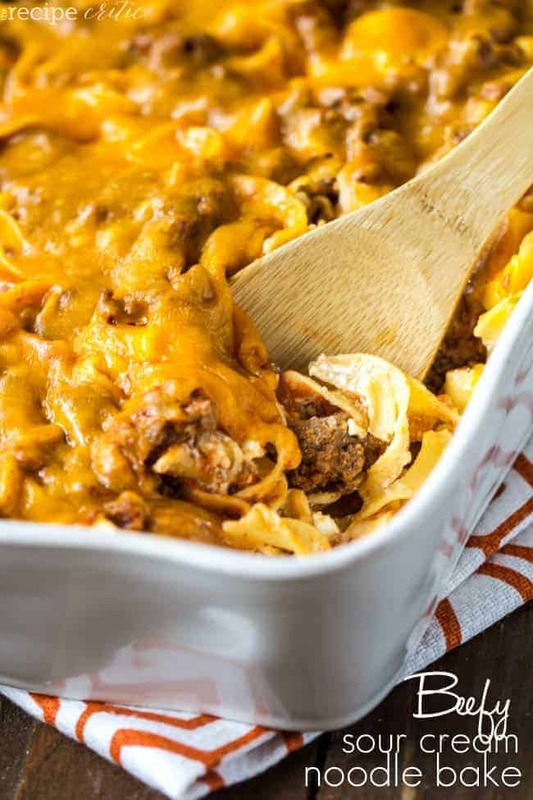 You can’t go wrong with this casserole. In fact, I think it is my favorite casserole to date! Layers of cheesiness and a sour cream cottage cheese combo with chunks of ground beef. It makes a great flavorful meal and everything combined is delicious! This is going to be a hit with everyone for dinner. Well unless you have a picky eater like I do! Delicious and cheesy casserole with a sour cream mixture that the entire family will love! In a medium sized skillet, brown the ground beef. Season with salt, pepper, and onion powder. Drain the excess fat. Add the tomato sauce and simmer on low for 10 minutes. Cook the noodles until al dente, drain and set aside. In a medium sized mixing bowl, combine sour cream and cottage cheese. Add the noodles and stir to coat. Grease a 9x13 inch pan and layer with half of the noodles, half of the ground beef mixture, and top with half of the cheese. Repeat the layers and end with cheese. Bake at 350 degrees for 20 minutes or until heated through and cheese is melted. This looks great!!!!!!!! PINNING IT! Made it. Loved it. Posted about it on the blog! I added your link so folks could see my inspiration! Yeah I was a little unsure about the cottage cheese but it turned out great! I love cream cheese though… I may try substituting it next time! This looks great! This is perfect for a weeknight meal. Thanks for sharing at Showcase Your Talent Thursday! I made this last week, I subbed the sour cream with Greek Yogurt and the noodles with whole wheat spaghetti! My boys loved it and are asking for it again. I am curious if this freezes well though, would love to have some on hand all the time! this was amazing! next time I will use low fat cottage cheese, sour cream and cheddar, whole wheat egg noodles..i almost ate the whole thing in 2 days. I need to lighten it up!!!! Good Morning! This is almost the same recipe my precious mother-in-law gave me 25 years old! The only difference instead of cottage cheese her recipe called for cream cheese. A definite favor of my children when they were young and now that they are in college! How much cream cheese if you use that I steF of cottage cheese? I am fixing this for my husband tonight, I might add a little more of each ingredient. I hope we like this. I really love cream cheese so I may substitute next time. Very good, will make it again! Can this dish be made the night before?? ?